Why am I loving raw food so much lately? Is it because the less agressively we treat fresh ingredients, the best we get out of them? These old systems to preserve food such as: marinating, smoking, salting… are being so wise and so careful with the food. I’m liking them a lot! This recipe is really easy and tasteful but (if there is a but) takes a bit of time. Properly speaking is not raw food… it’s been marinated first and macerated after; and the process takes 6 hours. Once you are through this, preparing the dish takes nothing. Now that Spring is here fresh sardines are in their best moment, they are so tasteful and succulent! And the combo with veggies is amazing… give it a try and tell me about it. My mom spent all lunch time repeating again and again how good these were and made me promise I would prepare them again for next Thursday!!! Ingredients for 4 servings: 20 fresh sardines, half a glass of Sherry vinegar, 2 tablespoons of soya sauce, half a glass of extra virgin olive oil plus 4 tablespoons, 1 garlic clove, 1 zucchini, 1 carrot, 1 green pepper, 1 tomatoe, salt and black ground pepper. Vinaigrette ingredients: 8 tablespoons of extra virgin olive oil, 2 tablespoons of sherry vinegar, 2 table spoons of soya sauce, 1 spring of fresh parsley (minced), salt and pepper. Scale sardines and wash under tap water. Using your fingers take their heads off and open them in half. Take the bone away and reserve their meat in a recipient. If you feel you cannot do it, then ask your fishmonger to prepare them for you. Make layers with them inside a recipient and pour the sherry vinegar on top covering them. Reserve for 2 hours in the fridge. After the 2 hours, strain and macerate with the extra virgin olive oil and soya sauce for 4 hours. Wash and cut the veggies in small dices. Prepare a sauce pan with a bit of olive oil and poach the garlic first, when fragant, add the pepper, carrot and zucchini. When tender, add salt and pepper and reserve. 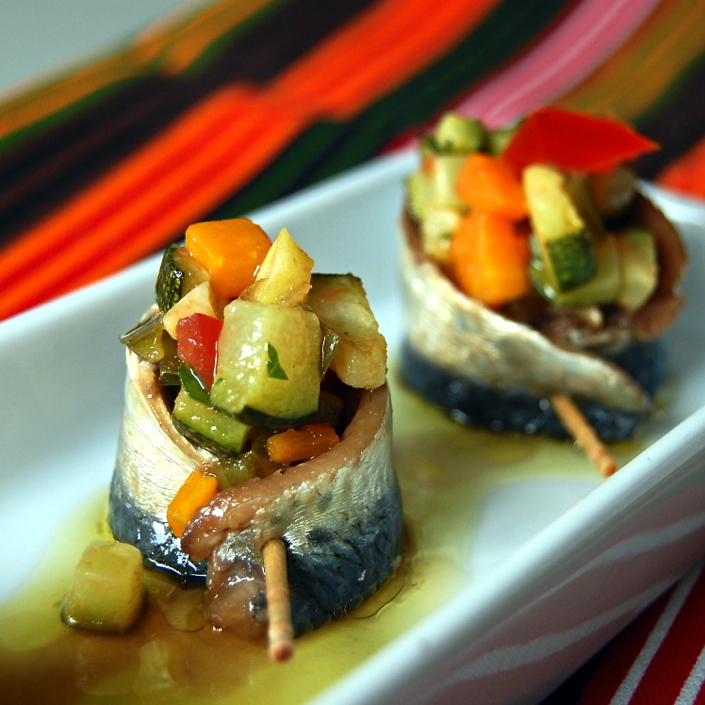 Prepare the dish: with the help of a tooth pick tie the sardines and place the veggies inside. Pour the vinaigrette on top and serve cool. You are so right Nuria. I am drooling over your pictures. Love marinated sardines and anchovies!! Un plato estupendo y sanísimo! Oh Nuria! This is so colourful! Love the whole presentation! Fresh sardines are not something that would be easily found around here but I have had them before and can attest to their beauty. This is a unique and delicious way to serve them Nuria. never thought of sardine raw but your picture tempting me to try it out Nuria! The interesting thing about this type of fish preparation is that it is equally lighter, more refreshing and much tastier than any cooked version. 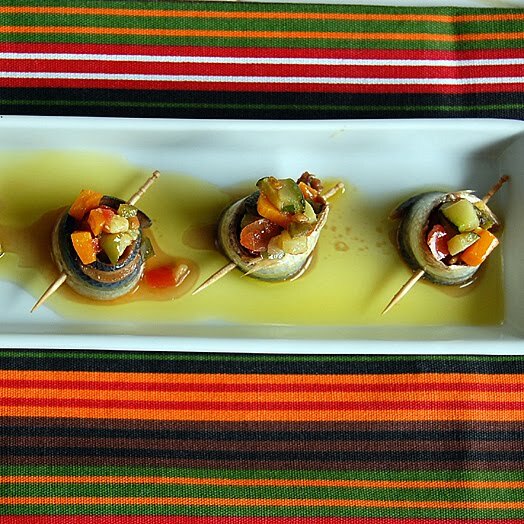 Wouldn’t you call it escabeche with vegetables? How do you prepare it? Is it different? I really wish I could find fresh sardines. Can you believe I have never ever even SEEN a fresh sardine??? I know, what a sheltered life I lead! LOL! These look amazing Nuria – and I agree, simple yet traditional ways of preparing foods really brings out the best flavors – and are full of nutrients! I would love one of your delicious sardine rolls right now! The fishermen are beginning to bring in fresh sardines and anchovies. This is a well-composed tapas and this takes a little time, but easy as you say. It’s a beautiful dish! I wish I could get fresh, lovely sardines here. Sounds delicious. I always adore your tapas Nuria and I really have to plan a party to showcase your recipes … I know my family and friends would appreciate every one of them. 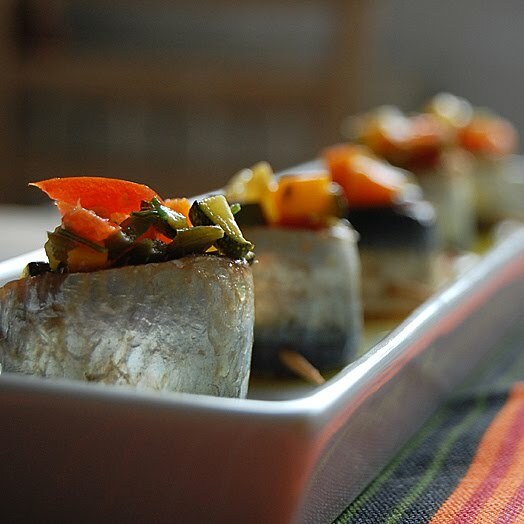 These sardines look excpetionally good … bravo Nuria!! Thanks for the toast Nuria!!! We must have secretly been on the same wavelength as I recently made sardines and swiss chard (although I used Spanish sardines from a can since fresh are sadly not available here). They were delicious, but I’d rather eat yours! Hi Nuria, I just noticed there is a WordPress blog that has stolen quite a few food blogger’s posts without permission and without links to our blogs. I left a request that my blog be removed. I thought you’d appreciate knowing you were on their list as well. Sadly, I have never had a fresh sardine. These look wonderful! Thanks for the blog! I found it looking for Spanish recipes. I’m brushing up on my Spanish cooking, studying Spanish too on Babbel.com (http://www.babbel.com). I find it rewarding to learn the cuisine and language in tandem…Gracias!! I love fresh sardines and fish marinated like this is popular in some parts of the Caribbean too. These look fabulous! 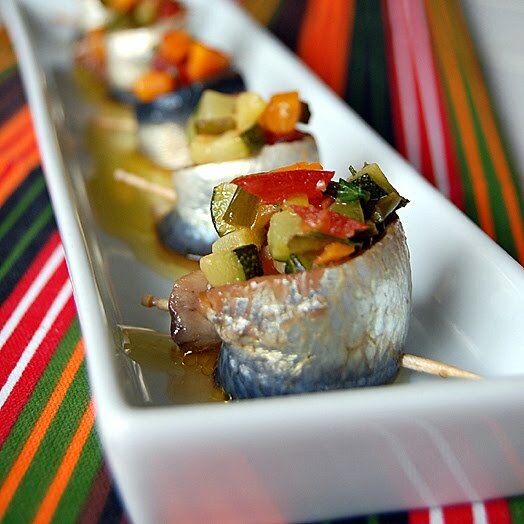 I’ve never prepared fresh sardines – only the canned ones, which I like very much, so I am sure I would LoVe these. Terrific photos too! Great post! I linked to your recipe on my blog.